Get the ultimate experience of the real snow and cool atmosphere. Snow Park Goa / Blog / Get the ultimate experience of the real snow and cool atmosphere. Are you bored with ancient old holiday ideas? Want something fresh and daring to stimulate you bodily and psychologically, leaving you energized and inspired by various fun-filled delights and illustrations? If that is the case, then Snow park in Goa is the ideal destination for you to achieve all these at one place. It is an amusement park in Goa and one of the places for couples, families, and kids. If you are looking for places to visit near Calangute, then the snow park, also known as the ice bar in Goa is ideal for your purpose. Do you think having drinks in ice glasses is only possible in foreign countries? Well, Goa is such a place where travelers get the option to visit the ice bar. Read on to know what the fun-filled activities are you can do in the snow park, and how can you turn your Sunday into Funday. Snow park in Goa offers an incredible setup of permanent ice bars. The cool temperature of the area prevails towards the negative region of the degree scale. There are ice sofas, ice glasses and many more features which will surely surprise you once you visit the place. You can order your favorite drink and have a good time there with your friends and kids. Sounds like a fairyland right? You heard it right. 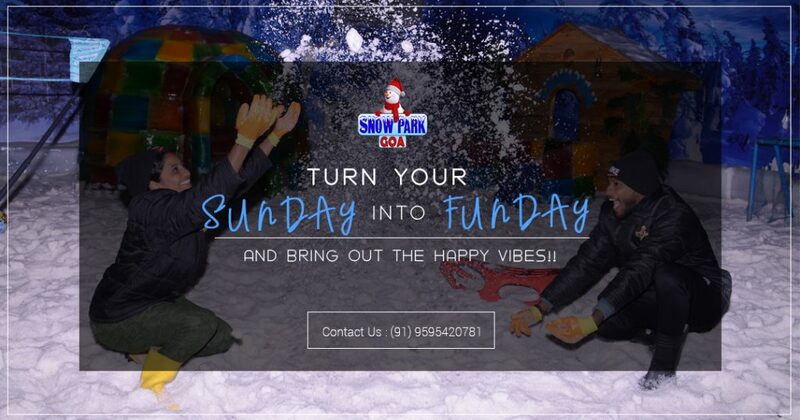 Snow park in goa is just like a place our from your favorite cartoon show on TV. Furthermore, there are also photographers present inside the ice bar who are ready to capture memorable moments of you with your partner or friends. Thus, make sure to visit this place when you visit Goa next time. Feeling sad to leave your kid behind? Worry no more as snow park is absolutely kid-friendly. Take your kid to the arctic world and enjoy the best time with your kid there. You will also get colorful drinks to order for your kid who will certainly love the unique idea of doing so. Enjoy and relish the ultimate gala time in the snow park with your kid. Furthermore, the snow park is located at the center of Goa making it easier for travelers to easily locate the place. There are unlimited enjoyment options when you visit the real ice bar in Goa. You can enjoy with your friends and family by engaging in a number of activities here, and you will get the experience of real snow which is a plus point. It will be a memory of a lifetime with such an “out-of-the-box” entertainment. Make sure to hover around the place taking colorful glasses in hand, and also make sure to click enough pictures for a beautiful snow park album at your closet. It is the ultimate way to turn your Sunday into Funday. Though there are various other places to visit in Goa, and there are a number of ice bars in the country, but no other place will provide you with an experience like the snow park in Goa. Therefore, pack your bags now and proceed towards the snow park in Goa to get the ultimate experience of the real snow and cool atmosphere. The Best amusement park in Goa that offers experiences worth treasuring forever.